There were many exciting ventures this month including the second festival of the year. This time I had a festival pass (bought in November and reimbursed as a Christmas gift) and I intended to use it – and then use half term to recover. There were also (as always) clashing events and those I missed out on. The dream of a helicopter, boundless energy and time or the ability to teleport, all somewhat in the future. After the madness of end of month submissions and a 16 hour after work stint on the laptop, the month started with a rare night off (which I mainly slept through of course)! 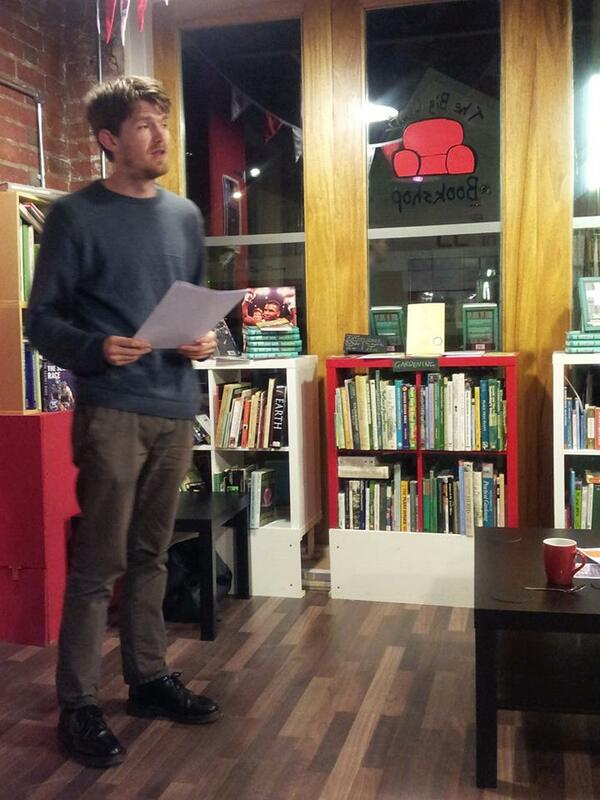 Then Permission to Speak, the wonderful spoken word event and brainchild of Rob Francis. Everyone was excited about Ira Lightman headlining, unfortunately he couldn’t make it. The night that unfolded was the first (that I know of) without a headline act, swiftly repackaged as a ‘Free For All’ with performers allocated more time. As always we were treated to a wide selection of novel extracts, short stories, music and poetry. It was really enjoyable, relaxing and a great tonic after one of the hardest work weeks I have in a while. We all missed Ira and hope he will be able to book in at the Scary Canary in the future. He really should treat himself. I spent my first writing day in a week, writing. I also caught up with family and almost burnt the midnight oil as a result. Two new poems, both need some time to bed down and then be mangled through edits, but I am happy with the initial results. It was a tense morning with an idling brain, so I am glad by the time my head hit the pillow, I had accomplished some work. I also discovered new opportunities, some marked for 2018 and some on my TO DO LIST – more on that in the future, especially if I am successful in my endeavours. When my head hit the pillow I couldn’t sleep. So I treated myself to a poetry book. There are many in the queue and some were gazumped as I picked ‘Beginning With Your Last Breath’ by Roy McFarlane. I planned to only read a few pages. By page 3 my eyes started leaking surprise tears and by page 17 my breath was caught and I knew I would be reading this story cover to cover… and I did. Jolly glad I did too. I slept well afterwards and will be reviewing his debut collection shortly. On Saturday Antony Owen had organised a Peace Vigil at Coventry Cathedral, where invited poets were performing 15 minute sets. I was disappointed not to be able to make it as I had a prior booking in Cheltenham. It looked like an amazing experience and I am keeping my fingers crossed that I can be part of another one later this year. 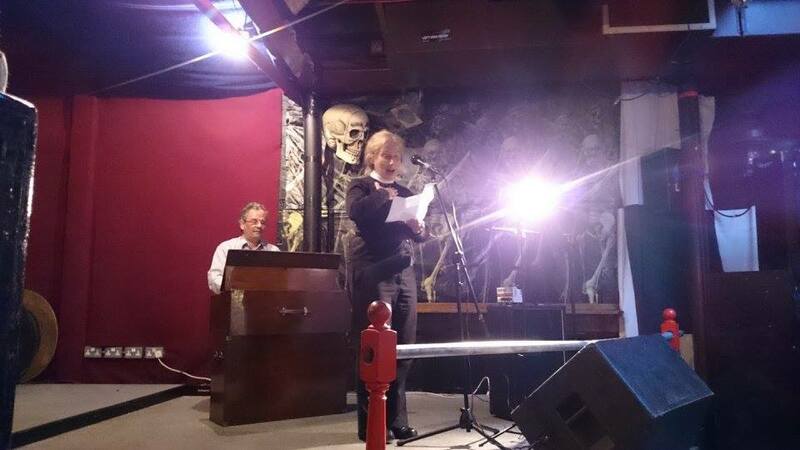 I did have a couple of poems read on my behalf. I think it was one of those unique, special events that would have filled heart and mind to abundant levels and I cannot wait to hear all about it. Antony Owen was joined by invited poets: Mike Alma, Josephine Allen, Mal Dewhirst, Jacqui Rowe, Ruth Stacey & Janet Smith. Antony said of the event it is an event for poetry to act as a witness to current world events and respond in acts of articulated remembrance. 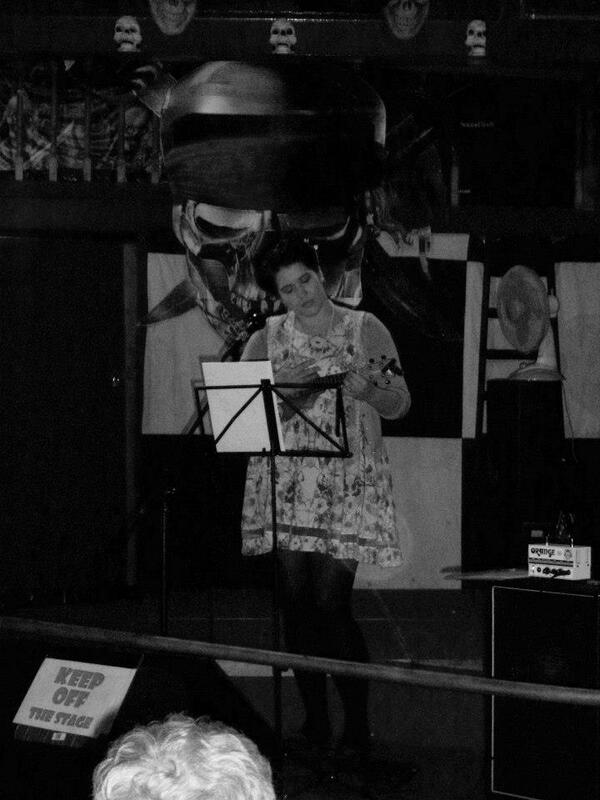 Saturday night I missed Hannah Teesdale’s Special Open Mic Event in Birmingham as my brain and body had had a full work out and my little car had already driven to Gloucestershire. Both events had a lot of positive social media coverage and it would have been great to reconnect and catch up with people in Birmingham. And I FINALLY started to read Ash Dickinson’s latest collection ‘Strange Keys’, which I had promised myself would be my Christmas book. I read three Christmas novels over the fortnight and ran out of snug time with poetry. Have made up for that since. Mr G bought me a couple of books for Christmas and I have spent the first part of the year battling through a novel. Which in concept was perfect and I see why he risked the gift. It was hard going both in terms of subject matter and chronology. Now I am on a book break for a bit unless the book contains poetry. I am too busy to catch more than snatches of time and poetry is perfect for that. I thought I had better read the collection before I see Ash again next week. Then I can delight in him performing from it. A conversation we had last month inspired an idea for a new poem that I managed to get to draft form this weekend. If I can work through it I think it will make a good performance poem. I love it when poets and their poetry connect to my mind in such a way that they just sow treasure. Plenty of wealth in my pad ready to go when I have a minute. Was set to be a corker. Poetry Alight in Lichfield on Tuesday night with Ruth Stacey (who I missed at the Cathedral) and Ash Dickinson, HOWL on Wednesday in Birmingham with Bethany Slinn, Sean Cottelli and Luke Kennard and SpeakEasy on Thursday with Matt Windle. 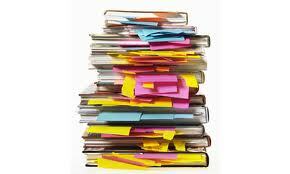 Followed by important deadlines and Writing West Midlands. It was a corker indeed. I had one main writing focus this week and all my spare time went into it, most of Monday, late Wednesday night and early Thursday morning before work. I managed to hit the deadline and now am keeping my fingers crossed. 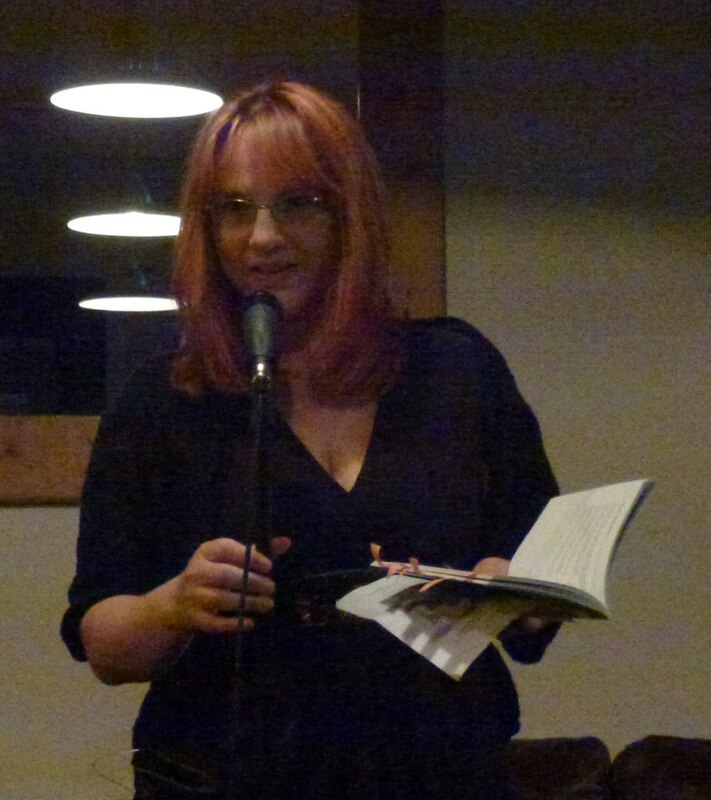 I had a great time at Poetry Alight, fully absorbed and inspired to write more poetry and to edit the Funeral Pyre one. HOWL was my next poetry feast, Wednesday evening. It was great to see lots of people I haven’t seen in a while and to watch incredible sets from Bethany Slinn, Sean Colletti and Luke Kennard. The night was on fire and made me feel like I didn’t want to ever extinguish the flame. Leon Priestnall was celebrating too. Howl’s 2nd birthday! 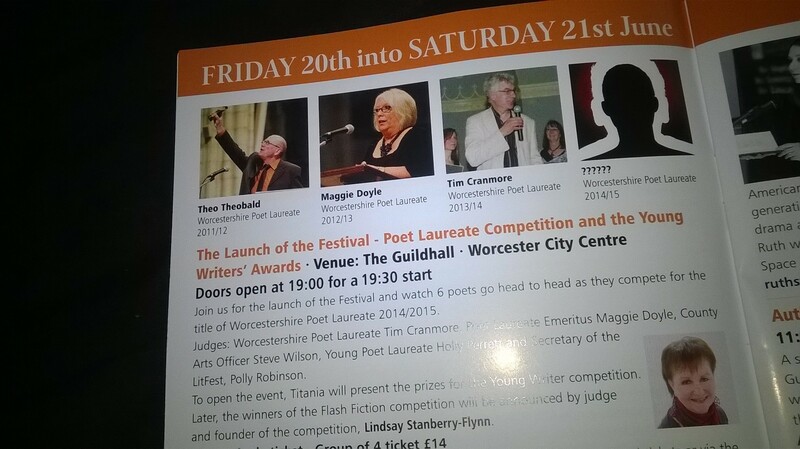 My poetry week was not done there, the following evening I went to Worcester for SpeakEasy, Matt Windle was headlining. The night was raucous fun. A wild enticing whirlpool atmosphere that in the end took everyone with it. Some great open mic spots and Matt Windle blew everyone away. He even brought a tear to my eye, a poem I had heard him perform before, moved me so much tonight. Again a delight to watch the audience who hadn’t seen him before, enjoy his work. Poet with punch indeed, as I said on social media ‘ a w e s o m e – if you look carefully enough you will find Matt between those letters’. He is this year’s Birmingham Poet Laureate and it is great to see him back on the circuit. 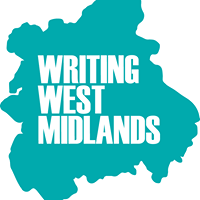 To complete my writing week I worked with Writing West Midlands, Spark Writers Group in Worcester at The Hive, where a new Assistant Writer joined us for a one off session, thanks Mollie Davidson. I also FINALLY read Fergus McGonigal’s first collection cover to cover. It is a great read and it has made me look forward to his next collection even more. Fergus is back on the Spoken Word scene and I hope to catch him soon. Buy your copy here. Mr G’s birthday, Valentines and the much awaited (since the launch party in November) Verve Poetry Festival. 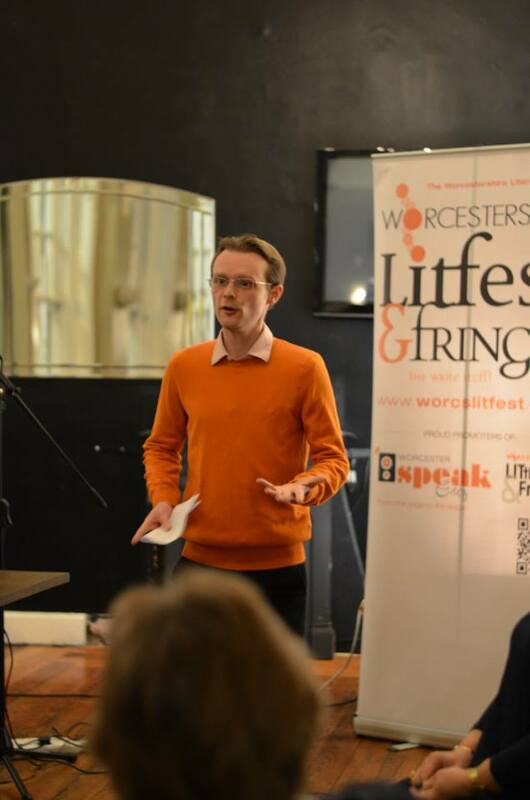 Unfortunately the weekend clashed with an event at the Swan Theatre in Worcester facilitated by Ben Parker (Poet in Residence). I am hoping he will do a third event as I had to pull out. I missed Matt Windle and a plethora of other Laureates at the Artrix on Monday as it was Mr G’s birthday and we were celebrating in Birmingham. There were other events but with submission deadlines and an all immersive 4 day festival at the weekend I felt the need to pace myself this week. 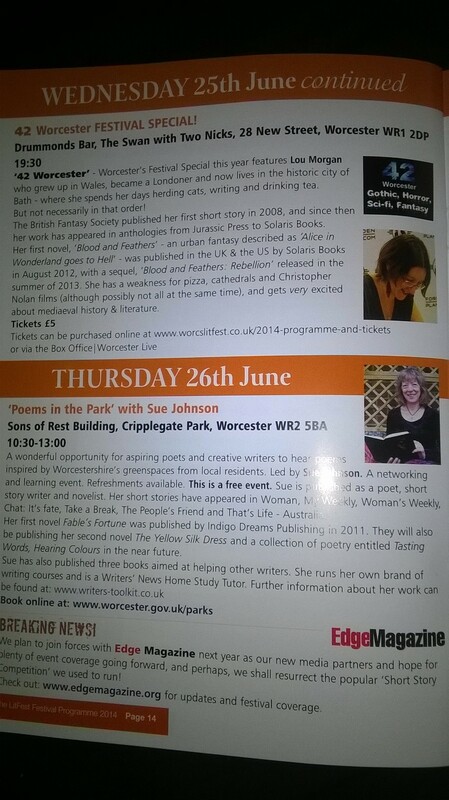 I also missed a night of poetry at Smokey Joe’s in Cheltenham. Thursday couldn’t come soon enough! After work I made my way into the city on the train and arrived at Waterstones for a perfect opening night of the Verve Poetry Festival. Read the whole story of the Poetry Parlour with Daljit Nagra and Hit the Ode here. I would love to stay in the city, but home really is less than an hour away and I want some book spending money. I want to suggest a poet basement next year though. Sleeping bags at the ready! I had a great night with poetry friends and had to wait less than 24hours for the top up! The weekend was immensely satisfying for my poetry soul and I will add more links when I have reviewed the events. An exciting opportunity arose from this experience too. I am writing a review for Sabotage Reviews. I have included events which I have not yet blogged about, this is another reason why I haven’t gone mad this week attempting to review the remaining events, that and I finally started work on the house. This needs to take priority this year, I will be busy as I started to organise events to perform at two festivals in January and this month took on some marketing/support for another two festivals. I finally read ‘The Glassblower Dances’ by Rachel McCrum, bought at Hit The Ode in 2014, I am slowly working my way through my poetry bookcase! The good news for you is it is back in print, so you could have a copy for yourselves, if you need more persuading it won the Callum Macdonald Award in 2013.
http://www.kickingparis.bigcartel.com/ copies are just £6.00. I am hoping to write some proper reviews early summertime, so look out for those. I read some of it on the train to get my mind set for Verve. A couple of treats to finish the month I was going to 42 in Worcester but I discovered Tom McCann (who hit the scene last September and is headlining in Stirchley next week), started a Spoken Word night in Kings Norton this year ‘Spoken Trend’. Jan Watts was one of the three headline acts and it has been forever since I saw her. She is busy producing her theatre performances of ‘Holding Baby’, widely acclaimed as brilliant and a must see. 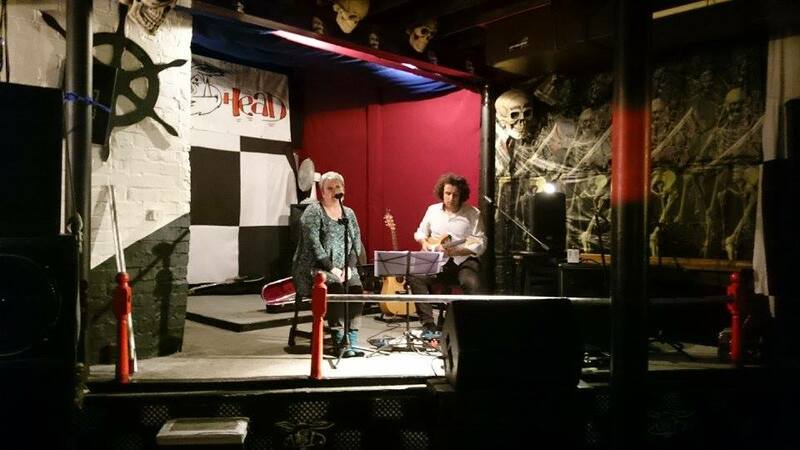 I headed over to Birmingham and performed on the open mic, alongside some well established poets and then sat back to enjoy the featured artists James Kearns, Clive Oseman and Jan Watts. It was a superb night. A definite recommend. On Thursday there was a slam night in Dudley featuring Emma Purshouse and in Birmingham a reading at Foyles with Roy McFarlane & Gregory Leadbetter (which I had tickets for) and Wine & Poetry Evening, the second of its type, organised by Emma Press & Cynthia Miller. In the end I didn’t make it to any of them, my car has been poorly for 6 months and is now finally fixed. I spent the day helping family, by the time I hit home it was gone 6pm and I was out of energy and time. And finally, I mentioned the Nuclear Impact anthology by Shabda Press in my January Review, now it is available for you to buy. It is an amazingly huge collection of poetry and has been a real labour of love for Teresa Mei Chuc. It is available for $25.00 and proceeds will be donated to charity. If you are in America, there are book launch readings taking place all across the country, Philadelphia, New York and in California, check those out. There are talks currently for a reading in the UK, I will keep you posted. 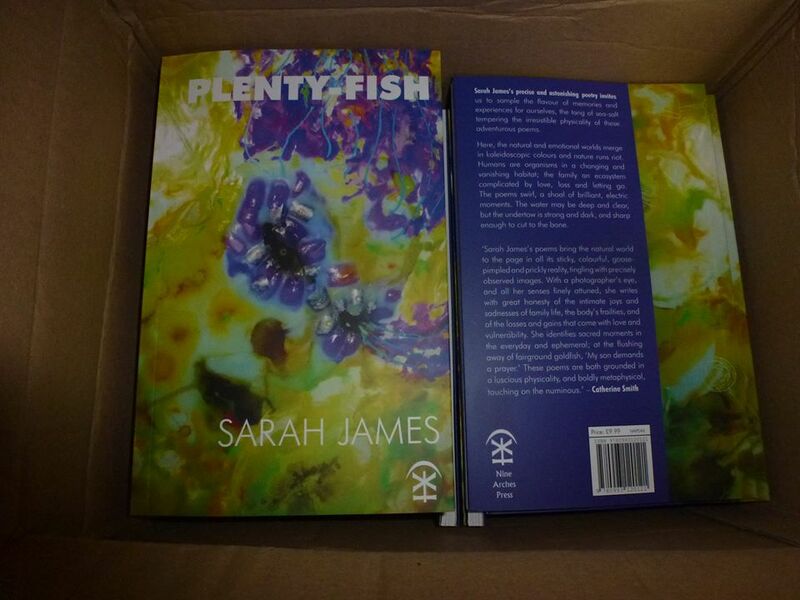 I am already organising two festival events for V. Press poets and my next headline is in Manchester in a fortnight, plus I am working on submissions and reviews and in addition to all this am now rallying the troops for another Arts Festival happening in early Summer. Oh, and I may be marketing for another MAJOR festival soon too. So my plate is pretty full and I still have 8 lingering poems from my weekend at the Verve Festival to work on, (as well as a house to sort – note for Mr. G.) and it is back to work, work next week too! I am happy busy but busy all the same. Blogs posts will be low priority now (with the exception of review posts for Verve and promotional drops) for a while, but there is plenty of historic posting in these waters so go and fill your buckets! 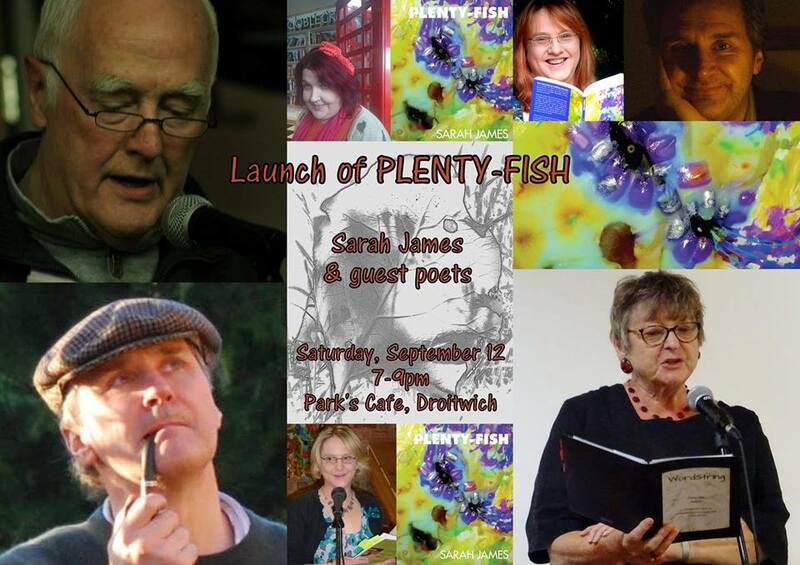 I was delighted to make Sarah’s launch for her latest book, Plenty Fish – published by Nine Arches Press on the 12th September at Park’s Café. 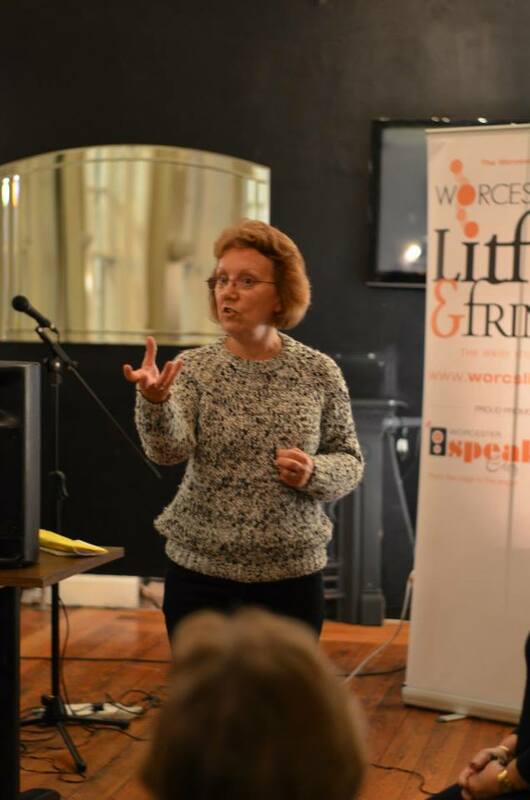 I was already on a high from leading my first WWM group in Worcester. It was a great night hosted by Fergus McGonigal. with Mike Alma, Kathy Gee, Ian Glass, Holly Magill performing their poetry too. Lots of top class poetry and a wonderful set by Sarah. It was a great night, I can’t wait to read this collection. 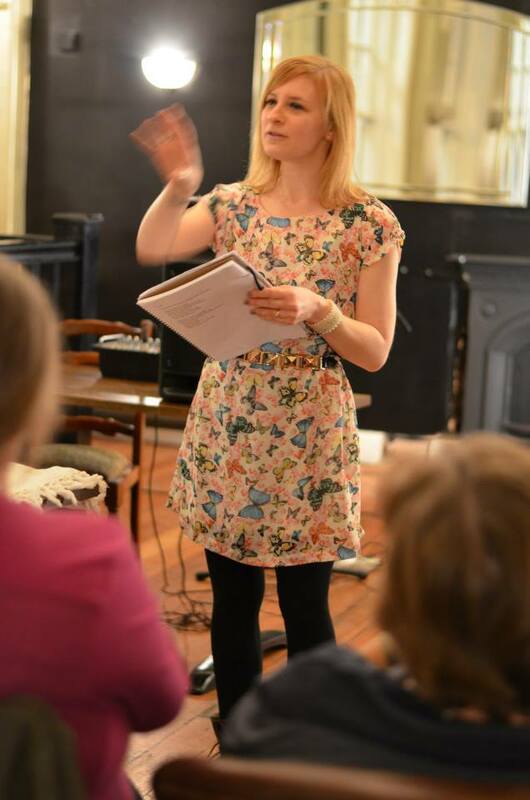 As I am so far behind with the blog, with over 3 weeks worth of activities to post about I have decided to bulk post about poetry events this month. I was delighted to make it back to this event as the last few have clashed with other things. There was a pop up return of Naked Lungs in the city the same evening over in Digbeth and my original plan was to try to get to both. The days of dual gigs are behind me I think, especially at the end of a busy week. I was still recovering from John Hegley and my night in Shropshire. It was a great evening packed with fabulous performances and new audience and open mic-ers too! Thoroughly enjoyed sharing poetry. 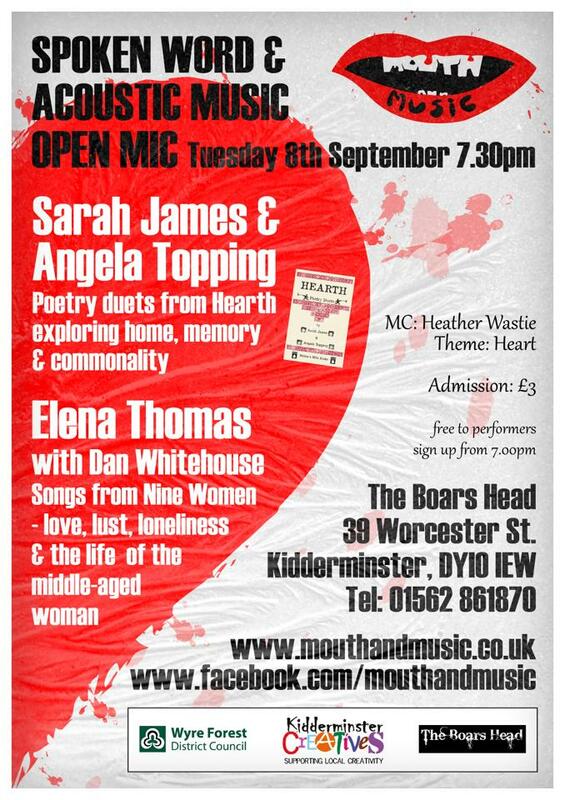 Headlining this month were Sarah James & Angela Topping, reading from their pamphlet Hearth and Elena Thomas with Dan Whitehouse. It was a lovely evening of words and music, some great open mic-ers, I especially enjoyed Jan performing with her husband, they were the opening act and got the night off to a great start. I usually find that writing to theme takes place a few days before the event, this month though because of the KAF special – Slightly Circus M & M event there were only a few weeks between the events. This was fine as with a theme like ‘Heart’ I was able to find an abundant amount of poems I had already written. The tough part was choosing which made the cut for my set. 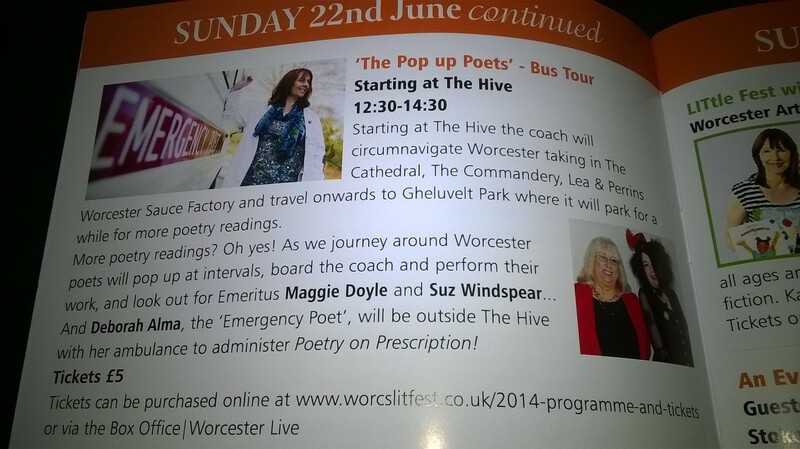 I am glad that Sarah and Angela were mindful that a small percentage of the audience had seen them in Worcester and they chose different poems to read. It was a smashing performance. September’s Mouth and Music was as pleasing to organise is it always is. Towards the end of the evening, Dave Sutherland sang a song he had composed using lyrics I wrote after hearing Elena Thomas (one of our features) sing her own songs at the launch of her art exhibition. Sorry for the slightly convoluted sentence but “Carrying the evening home”, the title of the song, refers to what we take away in our heads, and bodies, after an event. Last night, not only did I take away… Elena’s beautiful songs and Dan Whitehouse’s gently intricate guitar accompaniment; I also took away the fact that someone from the pub, who I suspect wouldn’t normally go to an event like ours, came in and listened to Elena because she found it provocative that Elena was singing about “the life of a middle-aged woman”. I love Sarah James and Angela Topping’s pamphlet of poetry duets, Hearth, and their reading stirred my own memories of home and family. The main thing I took away was a feeling of connectedness. 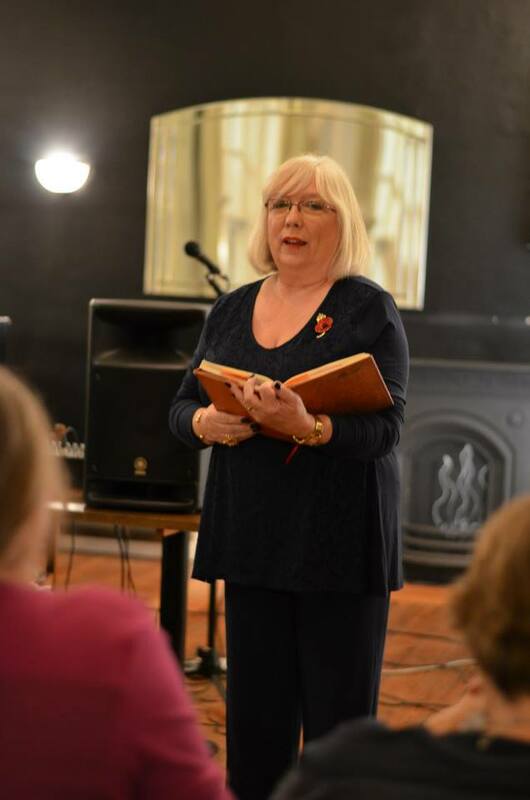 I was delighted to see a harmonium on the stage when Jan, a regular and popular performer, was joined by her husband to enhance her poems with musical backing. I enjoyed being teased by Mike Alma’s poem in response to mine about the gherkin which I wrote after seeing one on Angela Topping’s plate! In complete contrast, Mouth and Music’s own Sarah Tamar made a powerful connection with the plight of refugees and Tim Cranmore covered both ends of the … er … spectrum with 2 poems which were uncomfortable to hear, for different reasons: “Inappropriate physical contact” was very thought-provoking, and his final poem ….. ask someone who was there if you want to know. 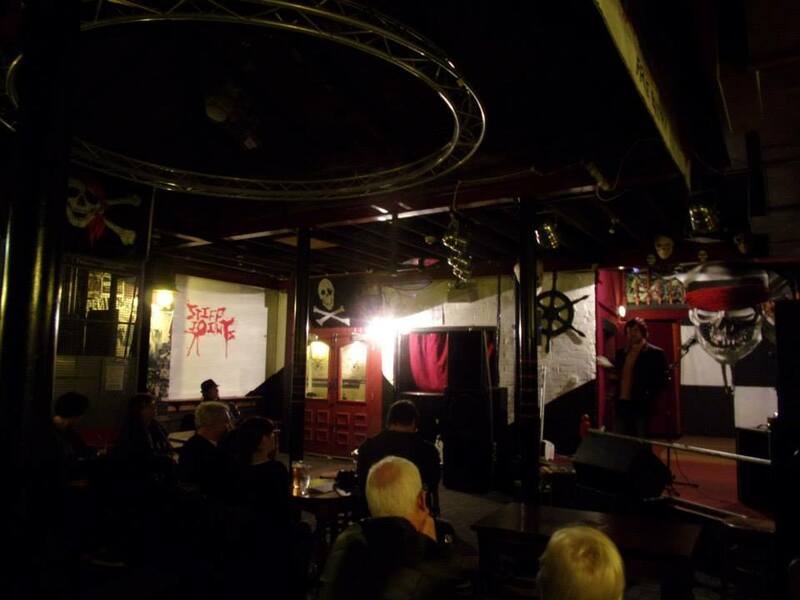 So many connections were made last night, thanks to featured artists, open mic performers, audience and the lovely staff at the Boars Head. Elena commented on Facebook today, “It’s a special place, Mouth and Music”. I take that as a huge compliment and look forward to seeing some of you on 13th October for some new connections! 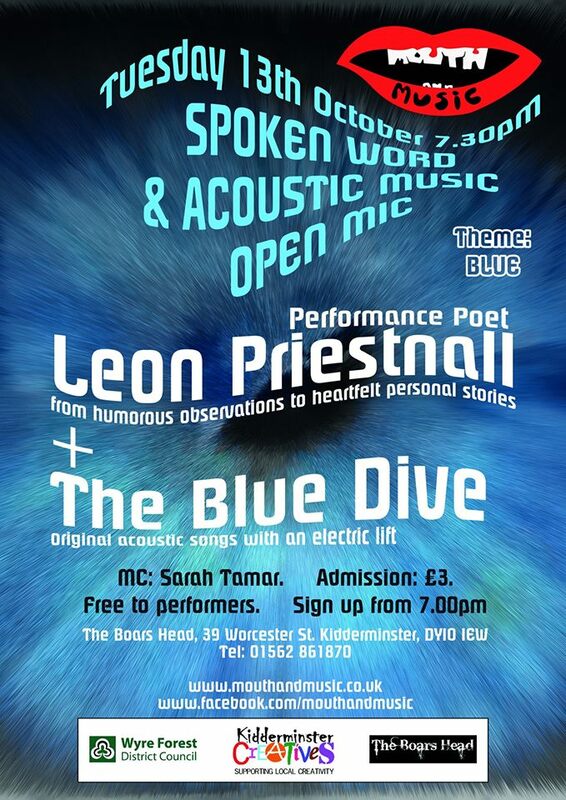 Next month Birmingham Poet Leon Priestnall takes centre stage, this month he headlined Hit The Ode and stormed it! The month after Swingerella takes the Headline spot. 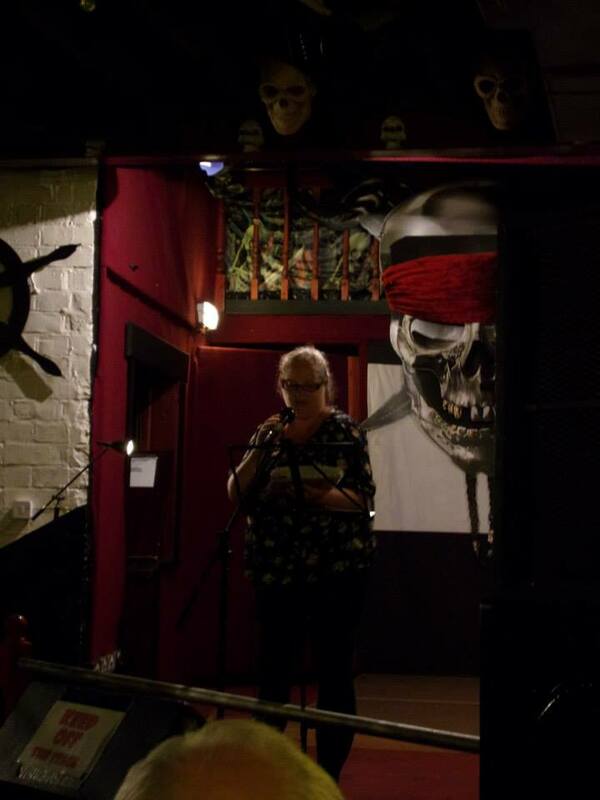 I have not been able to go to SpeakEasy since the Lit Fest and I was delighted to be back and to be able to take a 6 minute slot too. 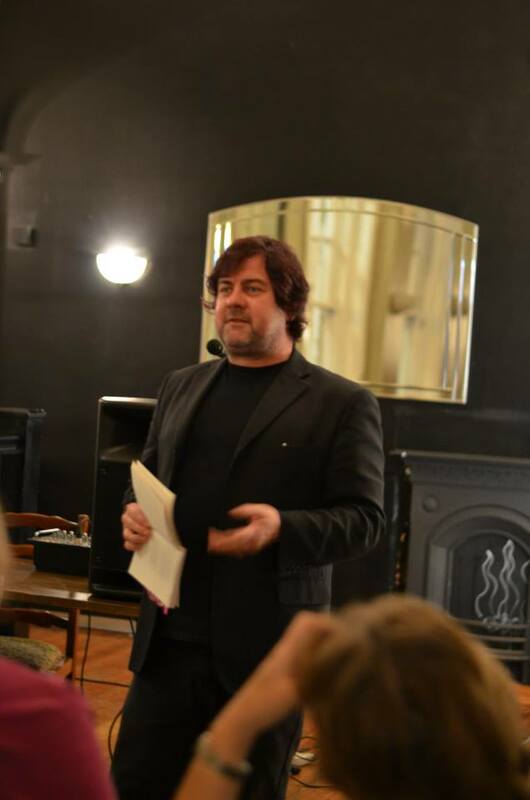 It was great performing poetry back in the glorious comfort of the Rectifying House. Despite not winning the raffle, I appreciated the new lamp, allowing more light to the page and it was great seeing it busy and catching up with poets I hadn’t seen for ages. 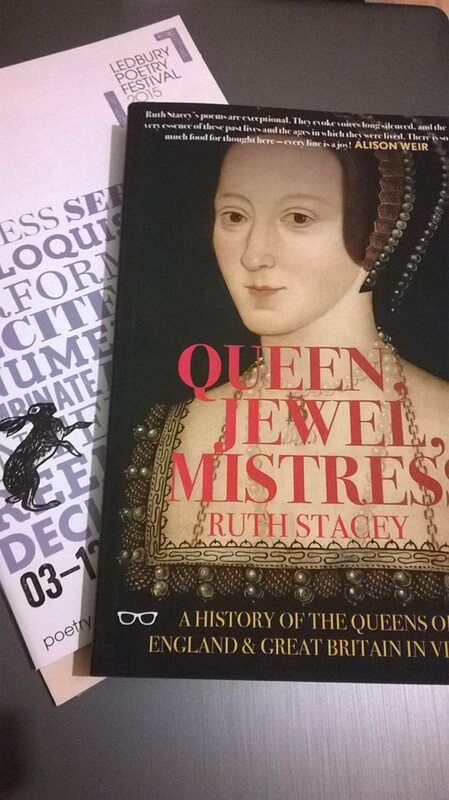 Ruth Stacey was headlining, reading from her latest book, ‘Queen, Jewel, Mistress’. I love the passion she has for this historical collection and that love came across in her set, full of enthusiasm and feeling. A very strong performance indeed. It was a superb evening of poetry and pleasure. FUN! 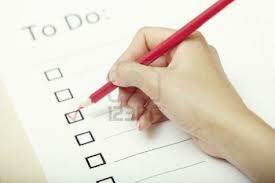 This week has been busy week, one which finally had a writing day in it. I took on a lot of work this week and even took a last minute booking on the 1st writing day I had planned. I am currently busy working on several things including my Hanbury Hall poems and writing material for an event at the end of the month as well as general submissions, I made 2 on my writing day (Fri) this included 4 new poems and 2 fairly new ones that I have been working on for a few weeks with the intention to submit. 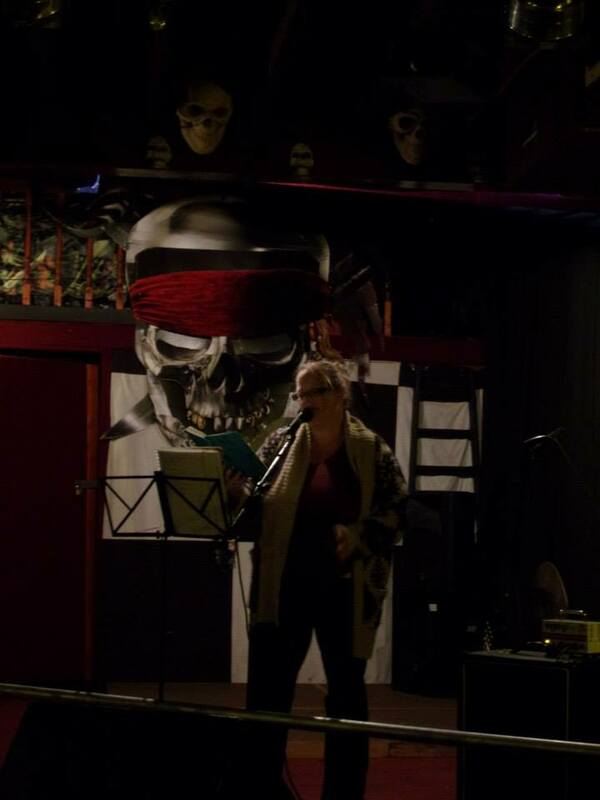 I performed a set for Mouth & Music on Tuesday night, the theme was ‘Remember’, I could have just read my recently published Paragram Poem ‘Picasso of Dance’, I intended to spend Tuesday writing to the theme – but I got called into work. 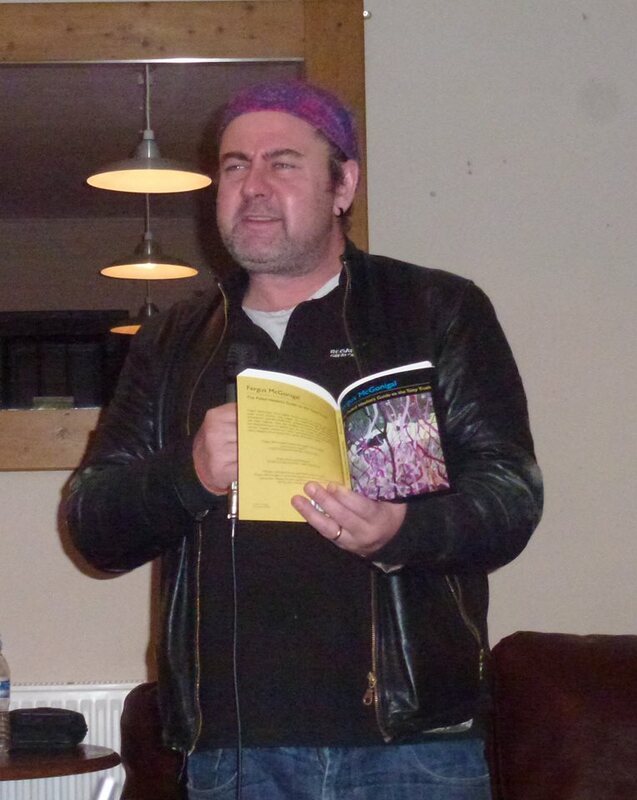 Instead I took both my poetry books to the venue and organised my set ad hoc. Amongst my set I performed an edited version of ‘Return to Stone’ previously performed at Roy McFarlane’s ‘Soulful Voices’. Roy had been booked to headline, unfortunately his mum passed away very recently. My thoughts go out to him and the family. 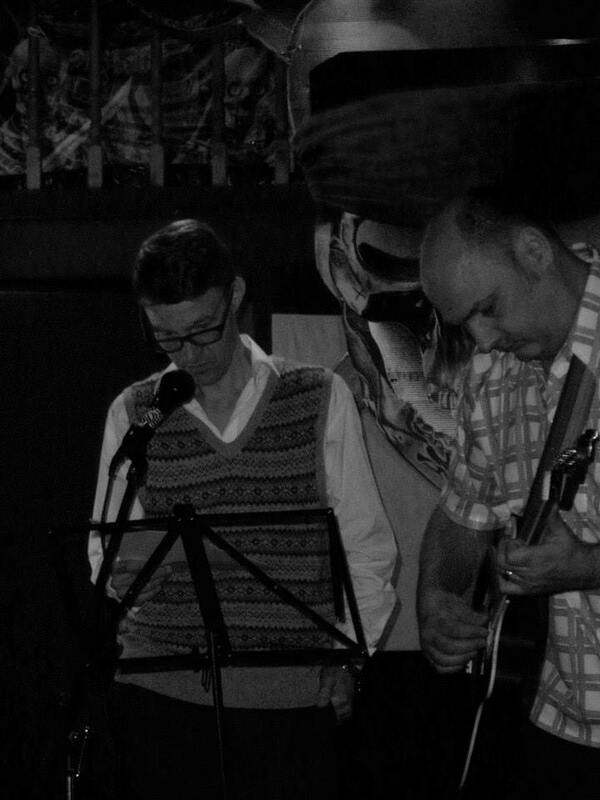 We were treated to Fergus McGonigal and Humdrum Express (Ian Passey) as headline guests and the whole night was great fun, alive with atmosphere – which after the beginning of my working week I felt I very much needed and benefitted from. On Friday I had a writing day which was long overdue, I spent 4 hours working on poetry for submissions and caught up on admin for another hour, before taking a well earned and much needed rest. Fortunately I did wake up in time to get ready for Stanza! 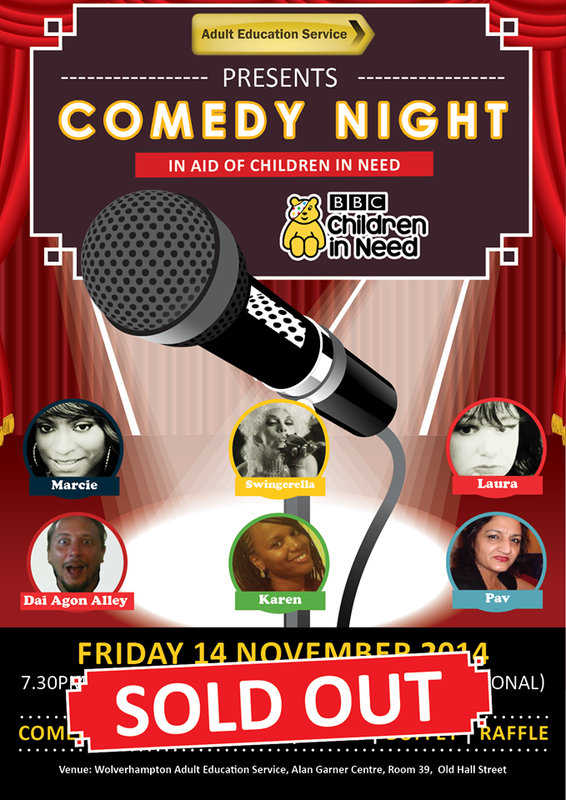 It was Children In Need on Friday and I had the opportunity to perform in Wolverhampton, but had already committed to Stanza and the meeting was a lot closer to home. 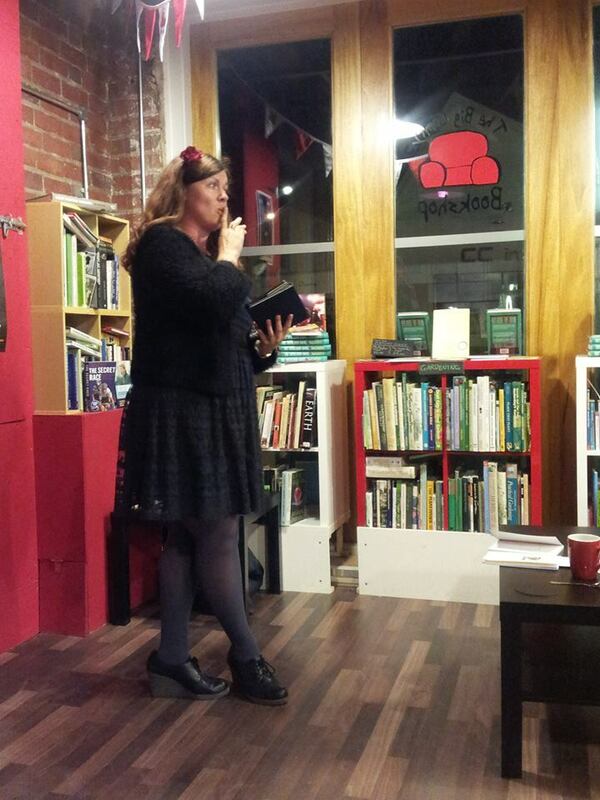 Stanza was a great night with lots of people, helpful editing advice and lovely nibbles. I love Stanza, it is such a friendly and helpful group. 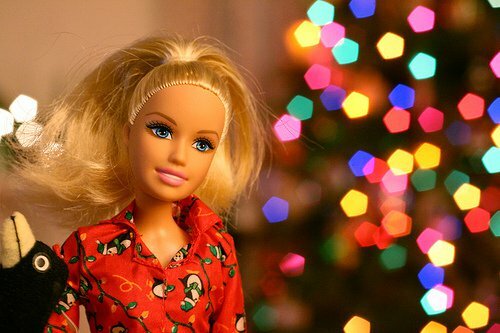 I am glad we have less than a month to wait before the next meeting – booked early because of Christmas! On Saturday I worked as an Assistant Writer for our group at The Hive. 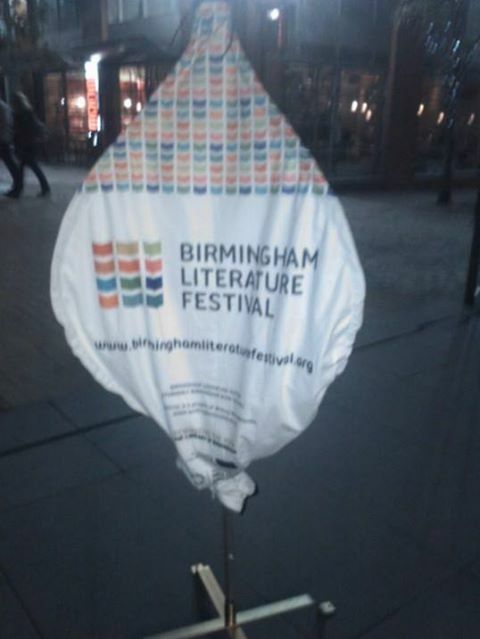 I was performing in the Birmingham Literature Festival, I missed October’s group – it felt like I had been away for months. I also had the 1st of 3 Mentoring sessions, I was asked back in the Summer if I would consider being a Writing Mentor, of course I said YES! It was a great first session and I look forward to continuing this work in December & January. Since then I have spent some time catching up with family, sleeping and avoiding buying bags! Next week looks good, I didn’t have a particularly blank diary, but I realise I need to re-energise, I have officially only committed myself to a set in Cheltenham on Friday and apart from this think I may have a week off. I am working in the day job and need some energy to finish writing projects, plus it IS cold and rainy – staying in is always more appealing in this season of dark afternoons and pre-Christmas busy-ness! On Thursday night I went to Worcester to perform at Fergus’s book launch and to celebrate his success as a published poet. I was touched to be invited to perform at the Book Launch along with Neil Laurenson, Claire Walker, John Lawrence, Maggie Doyle and Heather Wastie. A great mix of poetry to entertain people for the first half and then the delight of Fergus sharing lots of poetry from this new collection. I bought my copy of course, thank you Fergus for the lovely message, I shall cherish it along with the book and cannot wait to read it (your book is in a queue of ….. and will be read as soon as possible)! It was a cracking night and I am happy for Fergus. The venue was packed out with friends and family and people had travelled great distances to celebrate the next chapter of Fergus’s adventure. 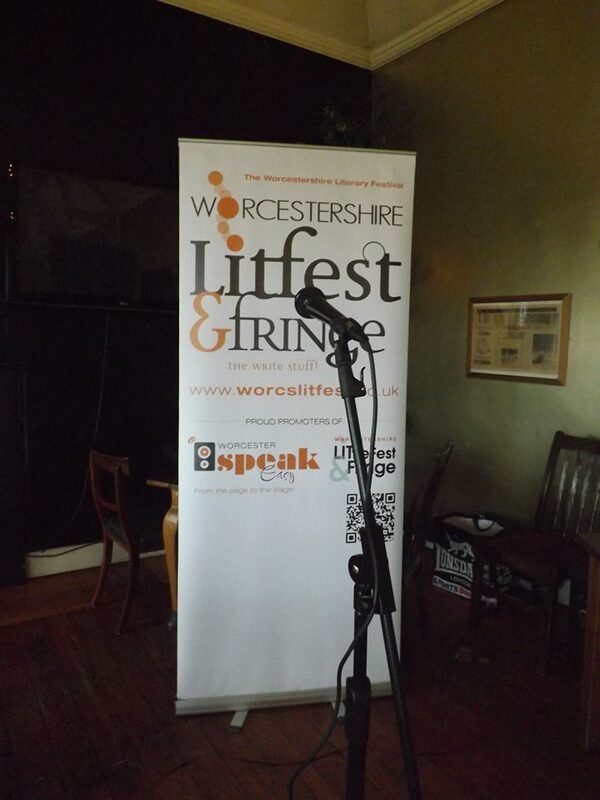 Is the current Worcestershire Poet Laureate, co-curator and host of the Worcester Lit Fest & Fringe’s monthly spoken word event, “SpeakEasy”, which runs on the second Thursday of every month at The Old Rectifying House, in the heart of Worcester City. Last year, Fergus was chosen from 20 commissioned West Midlands poets to be one of 6 poets to represent the Arts Council’s Poetry on Loan “Postcard Poets” project. Their aim is to bring poetry to library-goers across the region: through performance poetry; poetry workshops; and events like “Poetry on Demand”, where you can commission a poet to write a poem for you on the spot. From this autumn, Fergus will be working with Museums Worcester taking their First World War Remembrance Project to community centres, arts festivals and schools; and he will also be running several Remembrance Day events for MW. Fergus’s first collection, “The Failed Idealist’s Guide to the Tatty Truth”, will be published in November by Burning Eye Books. Congratulations to Fergus & thanks for the invite! November – Cork Poets, Fireworks, Book Launch, Performances, Workshop, Work, Getting Published, Writing & Wild Fire! Just taking a deep breath to read the title of this post makes me realise how busy this first week of November has been, especially as I used my only writing day (Monday) to catch up on household chores and laundry. The laundry was a bit of a mistake, 3 loads, it started raining, we have just enough airers for this amount, discover our central heating does NOT work. Fortunately Mr G called up our insurance company and they sent an engineer out – we have a new thermostat and more importantly, a warm house! We were beginning to ice up on the inside! 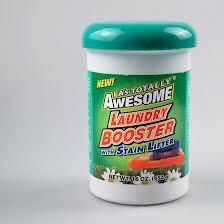 Unfortunately the engineer wasn’t here until Friday so the clothes are only just dry. We do have a tumble dryer mode on the washer but it seems to make everything several sizes smaller, so we avoid it for clothes. Hard to believe it was sunny back at the beginning of the week, after the monsoon of recent days. I accepted way too much work this week but it was all at places I have worked before so at least there were no extra miles getting lost or classes I wasn’t prepared for! It did result in two 5pm crash outs Wednesday and Friday though. I have an ever-growing list of current writing projects, 3 of which now come from workshops I have attended over the past fortnight. None of which I have managed any time on this week. All of which I want to get my teeth stuck into this weekend, well Sunday now. I have used today up in a flurry of road systems, motorway junctions and a gallery workshop. In writing the reviews of these events this week I have decided to go back to the old format of posting separate events. Here are some links so you won’t get lost (unlike me)! 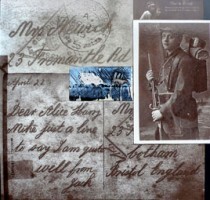 Nightblue Fruit – Antony Owen, with Guest Poets from Cork; Adam Wyeth, Cal Doyle & Kathy D’Arcy. 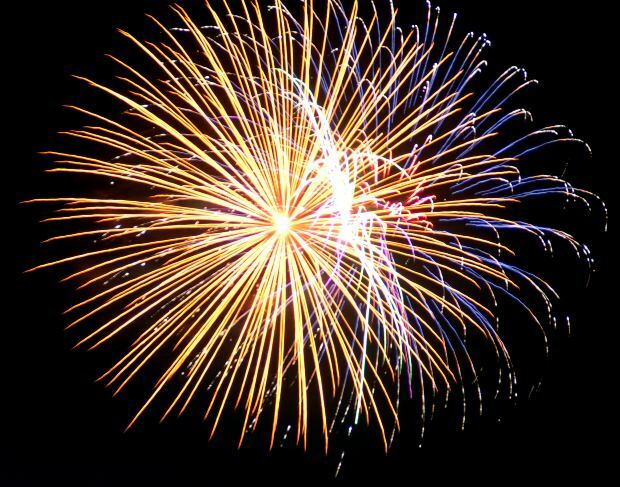 Wednesday 5th November was Guy Fawkes Night and despite it being a work night Mr G planned our first ever Bonfire Party. Last year we had a fire in the firepit, some sparklers and watched everyone else’s fireworks in the sky. 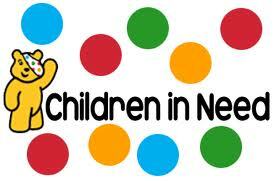 This year we invited neighbours, friends and Mr G’s God children, who loved it. Was great to see them work through fear of sparklers and fire and before the end of the evening they were (under supervision) throwing more wood on the fire and writing in the air with Sparklers. We took photos but have not uploaded any yet. Many of our neighbours celebrated on the 5th so there were lots of other fireworks to watch as well as our own. The fireworks still whiz, pop and bang as I write this, families waiting for the weekend to have a party. Mr G and I have always gone to public displays – nothing beats your own garden though, the fairy lights looked great on the summer house and a great night was had by all. At least 4 hours of fun in layers in the cold, before the rain came. Big thanks to Mr G for buying the fireworks and for Leyton for lighting them! I was exhausted after work and had gone to the supermarket too (I planned to cook burgers and had bought refreshments for the kids). I fell asleep watching teatime TV and could have happily gone straight to bed. By the time I woke up Mr G had the fire going and the garden was all ready for our guests. It was a great night, even if I was too tired to cook and the kids had all the Sparklers! 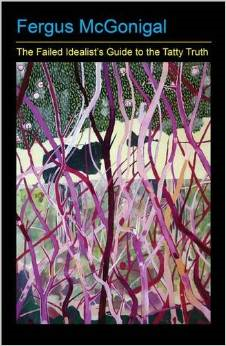 Thursday 6th November – Fergus McGonigal launched his first poetry collection. 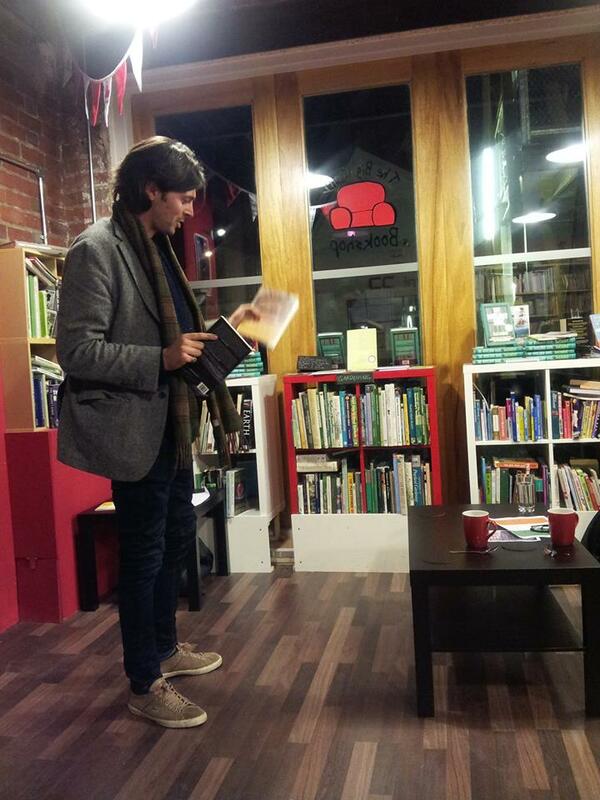 I was invited to read at his launch, I forgive him for making me go first! By Friday I was so tired it was a struggle to survive work, but I did and then slept for a few hours when I got in. Mr G and I had planned a quiet night in and that’s exactly what we did. I had hoped to manage some writing but I was too tired to think, let alone type. I had the night off completely. Except for checking emails on my phone – and thank goodness I did, as I received one from an editor telling me they were publishing a poem of mine in an upcoming print anthology. 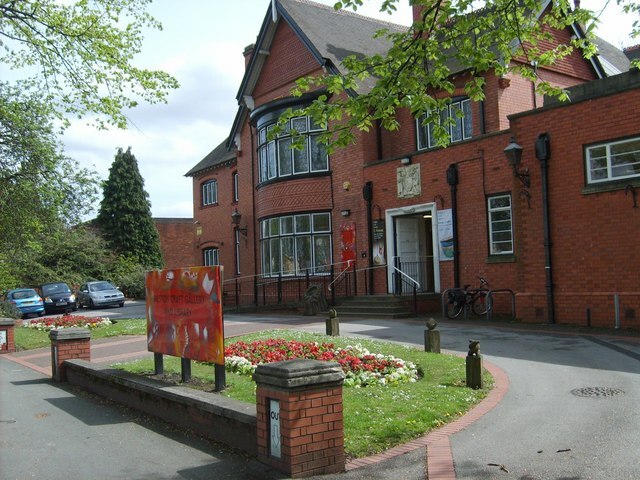 Saturday Last week I discovered a call out for people to take places on a workshop run by Emma Purshouse at Bilston Art Gallery, they currently have an exhibit called ‘Craft & Conflict’. I got extremely lost and it took twice as long (and then some) than it should have and even though I ended up on the motorway 6 junctions further away than I should have been on my way home, it still only took 35 minutes to make the 15 miles back, although probably more miles owing to the junctions, really need to get my Sat Nav mended. Anyway it was totally worth the extra petrol and road stress. This was the 2nd session of the day and the Arts Services had advertised it as intergenerational, which it was this afternoon. Children have great imaginations and I was impressed by the writing of younger members of this workshop. The Gallery collection was more than I expected, more pieces. There was so much that grabbed me that I plan to continue producing work from this workshop. With such a busy week of work and events by Sunday my tiredness caught up with me and once again I didn’t make it online to complete my planned schedule, nor did I find time to write my Wild Fire poems from David Calcutt’s wonderful Community garden Workshop. My list of writing projects is growing faster than the first scarf I knitted, when I forgot how to cast off! Needless to say I didn’t make it to the Community Garden Bonfire to read my non-existent fire poetry, I barely made it to getting dressed! 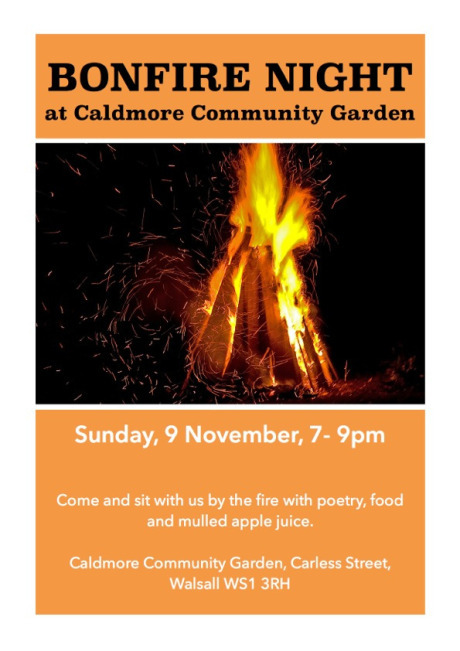 Caldmore Community Garden Bonfire with Poetry readings with David Calcutt. With work booked the next day, I had an early night. Sure this was a great night I missed and I look forward to hearing all about it. 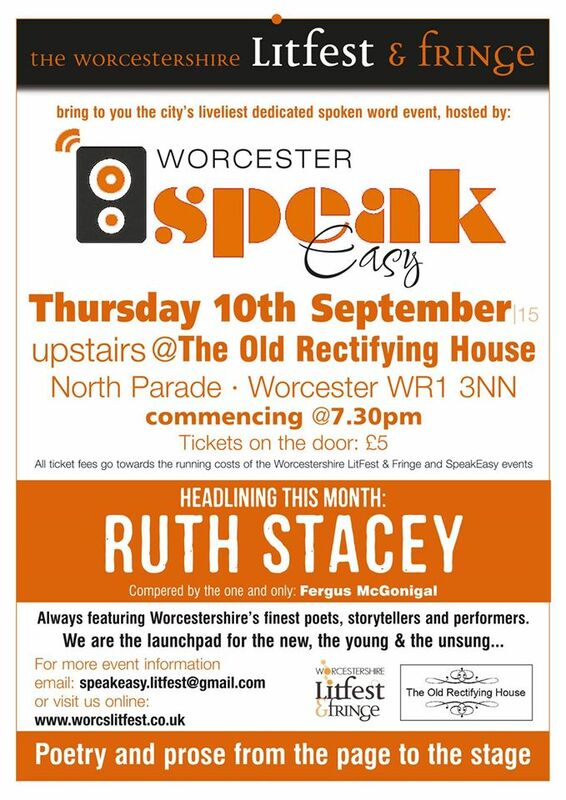 Last week I took part in two regular Spoken Word events I attend as often as I can, Mouth & Music and Worcester’s SpeakEasy. 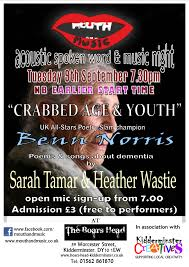 Tuesday 9th saw Ben Norris headlined Mouth & Music also headlining this month were Heather Wastie and Sarah Tamar. It was funny seeing Ben again – last Thursday I saw him perform at Cherry Reds as part of the Naked Lungs event, then again on Saturday in his one man show The Hitchhiker’s Guide to the Family at the MAC and then just a few days after at the BHG. This happens often with artists who will be booked for events within the same month, however, Ben Norris may have had other reasons for this last blow out in and around Birmingham… he has since moved to Cardiff (tissues passed around the Midlands), he is gained by Wales. Off on his next exciting adventure. I finally managed to buy Ben’s pamphlet book, I hope he gets more published in the future, it is a great little press which publishes 6 poems and has several BIG name performance poets on there list, such as: Elvis McGonagall (who I see next Wednesday at The Hive, organised by Worcester Lit Fest) and Martin Newall, who I performed with in Essex about 15 years ago! I usually write to theme, this month has been busy & I didn’t have time. Instead I found suitable age poems to perform. 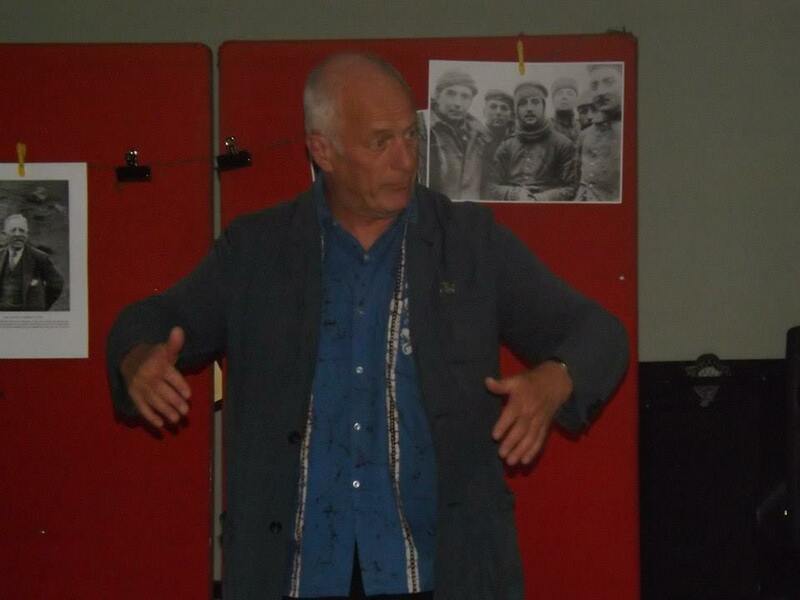 It was a great night with fantastic and touching performances some poetry about war, others about Dementia. 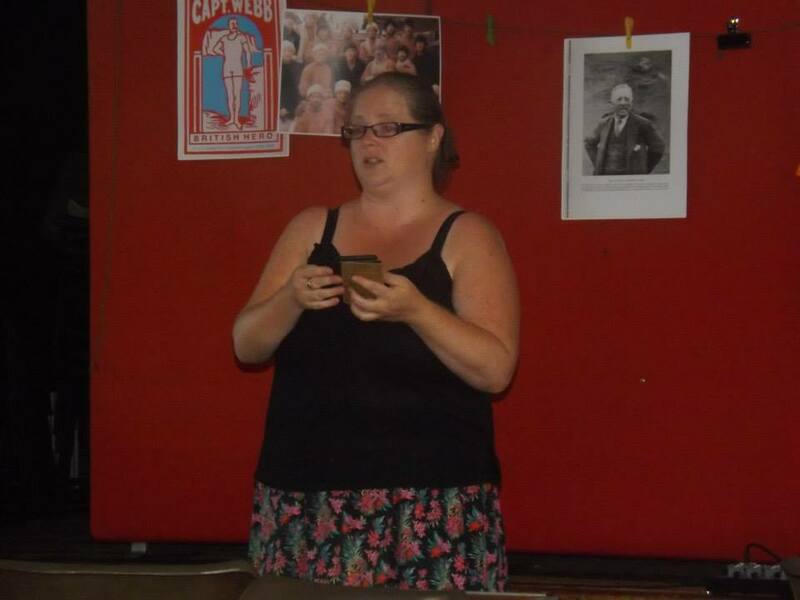 Heather Wastie also bravely attempted group poems, three of them! They can be seen on the Mouth & Music Blog here. It was a great night. 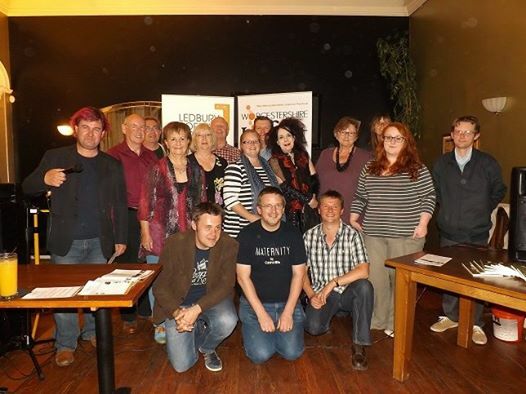 We also had 2 poet laureates, Tom Wyre – Staffordshire’s Poet Laureate and Fergus McGonigal Worcester’s Poet Laureate. They both performed War Poetry. 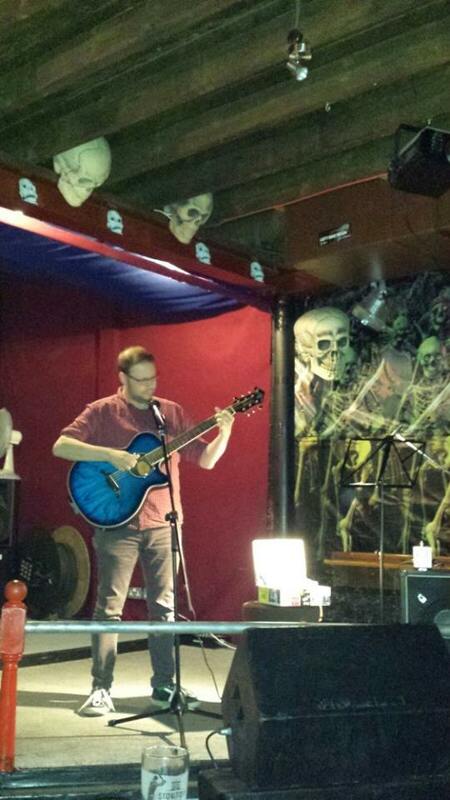 On Thursday 11th I went to SpeakEasy in Worcester. Headlined this month by Peter Wyton. 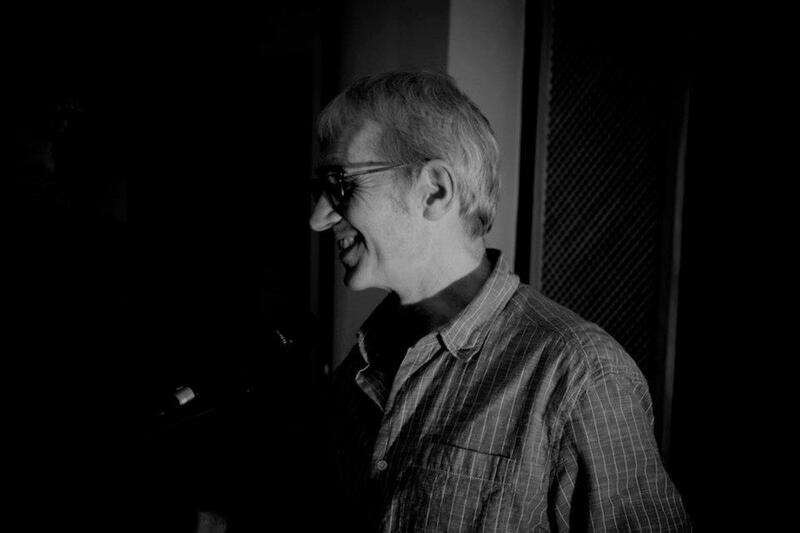 Peter Wyton is a ‘poet of page and performance’ who has published a number of books and who has appeared on BBC Radio. 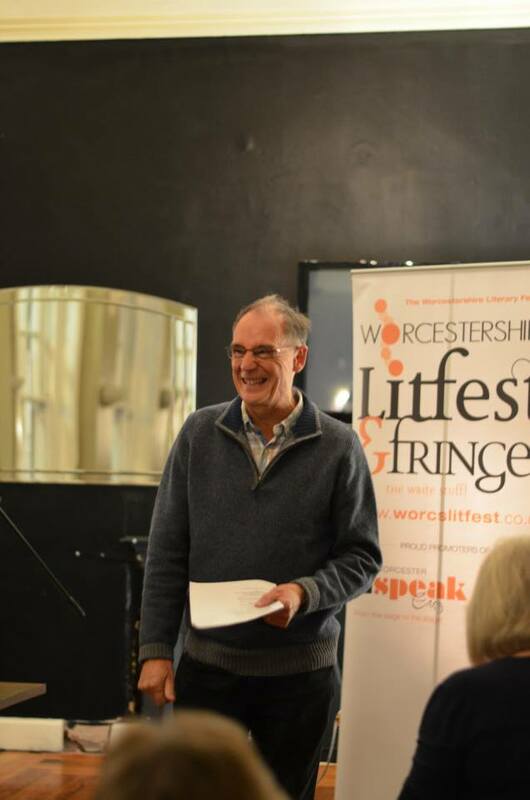 He is a widely published and prize-winning poet who has appeared at venues as diverse as Cheltenham Literature Festival, Glastonbury Festival and Ledbury Poetry Festival. It was a good night and I was delighted to be performing just before the headline act. Brenda Read-Brown also treated us to a set, she won the WLF (Worcester LitFest) POETRY SLAM and collected her poetry trophy. Performers included Kevin Brooke, who’s new book is being launched on the 26th September at The Hive, Charley Hammond, Maggie Doyle, John Lawrence and Mike Alma as well as open mic spots. 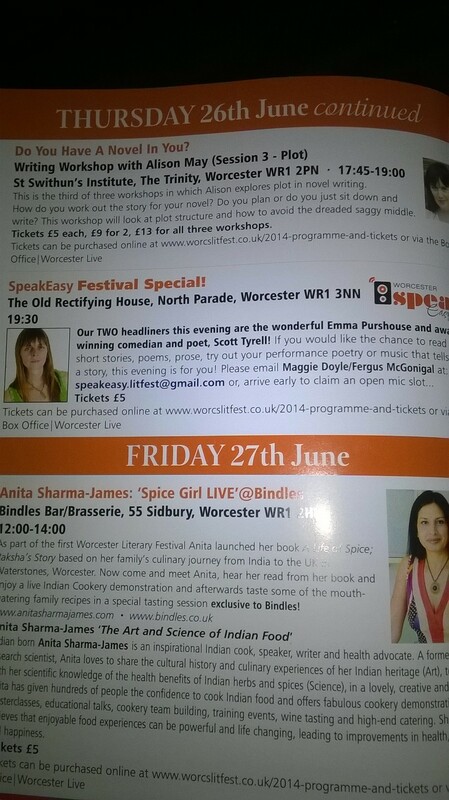 I always enjoy a night at SpeakEasy and this week was no exception – and next month they are celebrating the first year of the event, what a success it has been, delightful to have started when the re-launch of Worcester Lit Festival spoken word event, I even remember voting on what it should be called on the website. SpeakEasy this month was packed, much to the relief of Maggie Doyle who was hosting whilst Fergus McGonigal (current Worcester Poet Laureate) is away over the summer. It had never crossed my mind that Maggie would panic about attendance. There were no open mic spots left, so I settled back to enjoy an evening of poetry. I went with Claire Walker who was performing, I love her work. There were many other talented poets as well as some first timers. It is unusual for me not to take part, sometimes it is refreshing to just breathe and listen. The flipside is the adrenalin doesn’t kick in and you go straight to bed, when you get home. 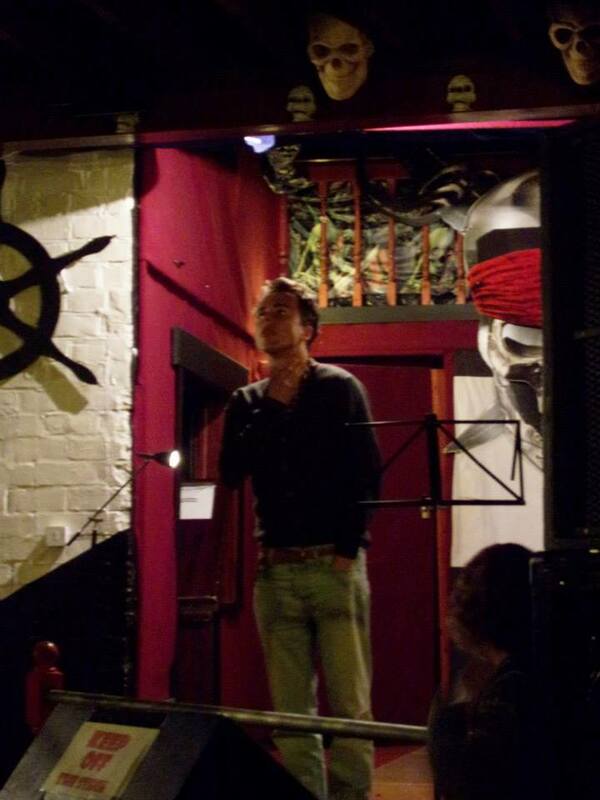 The headline act was Ben Parker, an Oxfordshire poet who comes from Worcester. Fantastic poetry and a refreshing set that was enjoyed by everybody. 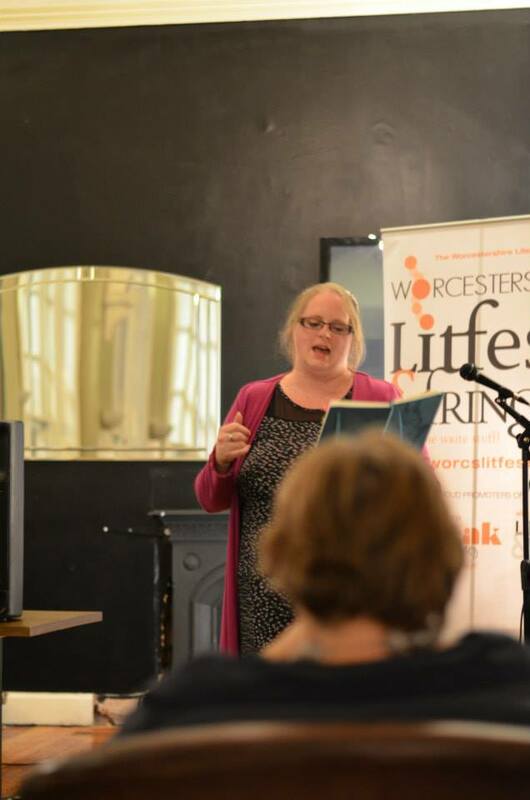 I have loved being part of this year’s WorcsLitFest, having so many events and opportunities on my very own doorstep has been wonderful. I didn’t plan it very well – as I also took on a full week of work – and missed many daytime/ teatime events I could have otherwise attended. There’s always 2015. I also missed the last 3 days of the festival due to performing in Birmingham and celebrating birthdays. My highlights were being asked to guest spot for the Decadent Divas (something I was unfortunately not able to do as it clashed with Dave’s Woodstock Party) and performing at Jonny Fluffypunk’s event! I went to the launch event – a fun packed event concluding with the new Poet Laureate being chosen, congratulations to Fergus McGonigal our new ambassador for poetry and Claire Walker, who came 2nd and Suz Winspear who came 3rd. Prizes for the young writer competition and flash fiction were also announced. The next event was just 30 minutes later in Malvern, on the hills. I was asked to take part in this and would have loved to, but had Writing West Midlands job the next day. I hope I can take part in the magic next year. Midnight Moonlight Solstice Walk – celebrate the solstice, walking on the Old Hills with poetry and stories on the way. Ruth Stacey held a Native American Myths workshop that I would have loved to attend – but due to hotfooting over towns for Writing West Midlands job I couldn’t have made it. I also missed the Authors’ Fair at the Guildhall, the Romantic Novelists’ Panel and by Cat Weatherill. 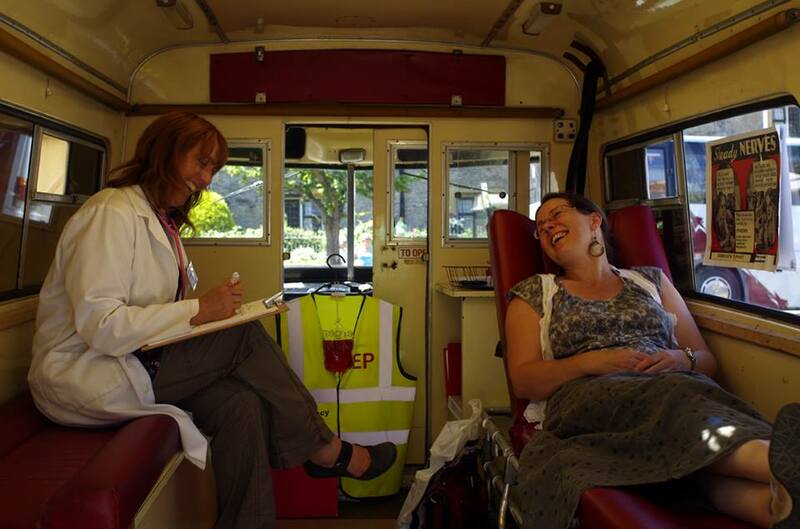 On Sunday I was part of the Pop Up Bus Tour, a fun event! Including performances on the bus and in the park. 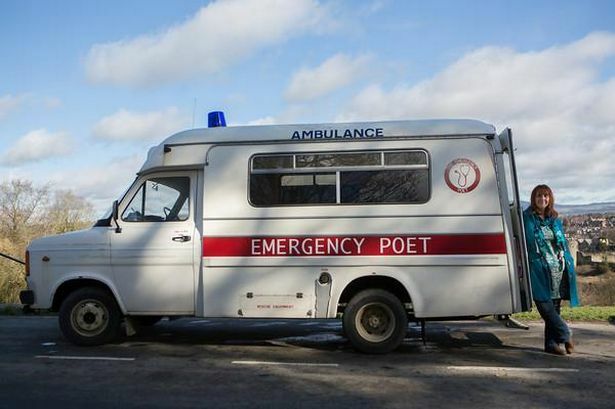 The EP – Emergency Poet was parked up at the Hive. It was great to see Deborah Alma and James Sheard again and this was the first time I had seen her emergency ambulance and had a consultation, great fun. Deborah does many festivals and Lit events and is well worth looking up and going to see! 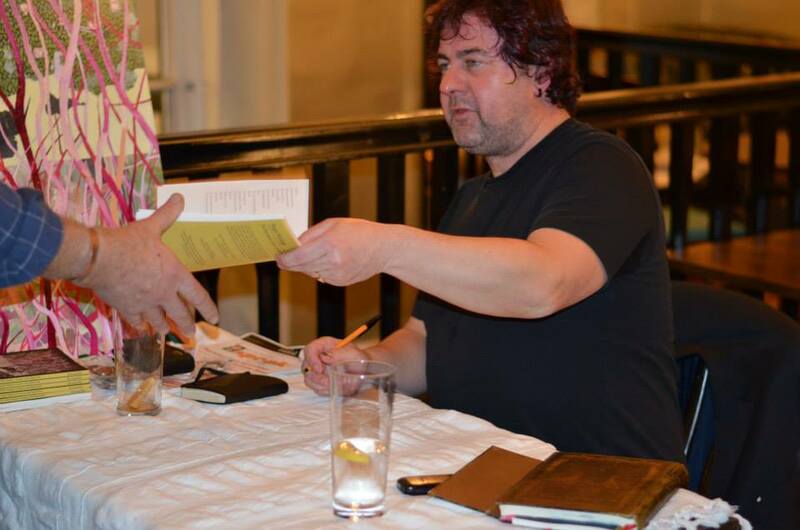 Then I hotfooted it over to Birmingham to take part in Poets with Passion at the Sahara Restaurant. Missing the Beatfreeks performing at the workshop, I do see a lot of Beat poetry performed in Birmingham, so may well have seen it before. 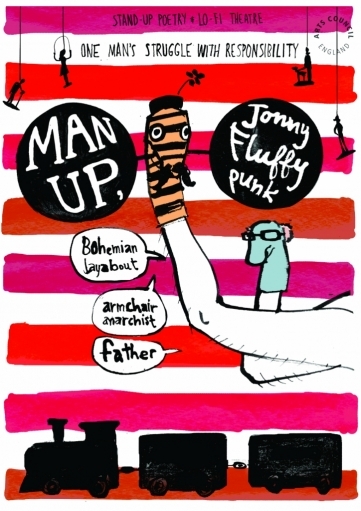 On Monday I worked and had forgotten I was going out at all… fortunately I remembered and went to see Man Up Jonny Fluffypunk. Jonny is a stand up poet and one of my favourite discoveries in this world of performance poetry I have immersed myself into. I have seen him perform twice as a headliner but his one man show is not to be missed! I am not going to say more about it because it is unbelievable and you need to catch it for yourselves if you ever get the chance! Amazing. I didn’t know before I got there that there had been a shout out for performers as they were trying to create an interval in an interval-less show. I did have a poem on my phone, a poem that was on my set list for SpeakEasy on Thursday, but this opportunity was too good to miss and it was one that Fergus McGonigal, Adrian Mealings and I took up! 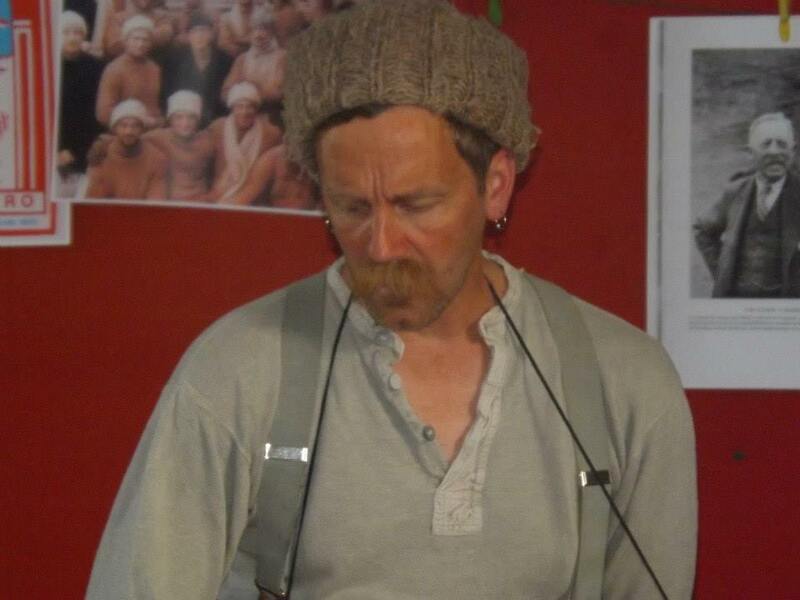 I performed my Adjectives poem, written for Mouth and Music, it went down well and Jonny loved it – until the beret line and a slight ad lib on my part! 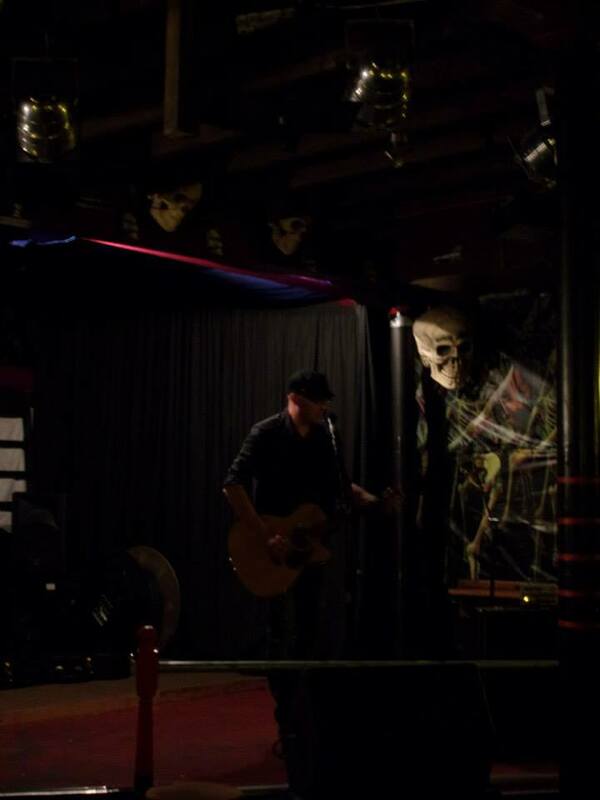 It was a great feeling and thanks to WLF Crew and Jonny for letting us have some of the stage time! I took Tuesday off from events, although there were plenty of things I wanted to see, I knew with wok as well energy was needed to survive the week. On Wednesday I went to the Festival Special of 42 with Lou Morgan. 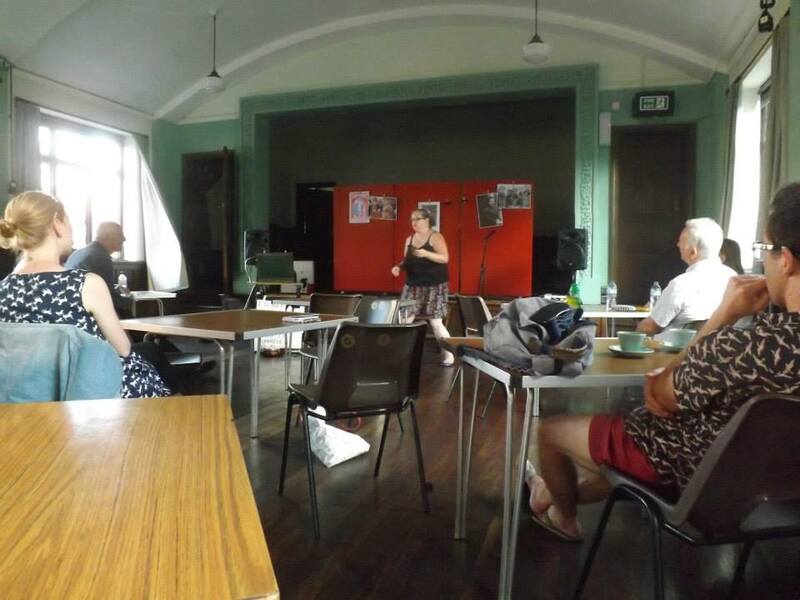 It was a great night and I enjoyed putting my set together, the newly written 52 poem about Martha Graham, The Picasso of Dance, went down very well and had lots of feedback. It was a cracking night and Lou’s Q & A session was very interesting. I regret not having the time to mingle and chat afterwards, I was so tired and knew I wouldn’t be home until gone 11. On Thursday after working I frantically re-jigged the set list for my 6 minute slot and filled the Adjective gap with Moustaches. speakeasy Festival Special was just that a special night! Some amazing open mic-ers and guest performances and also 2 headliners, who blew everyone out of the water! Scott Tyrrell was new to me, a Northern Poet full of comic wit (who left Worcester for Glastonbury this year!) His material was heart felt and chuckle full – mostly about Fatherhood, my favourite poem involves a book review for Where the Wild Things Are. Great stuff. Emma Purhouse I discovered back at the beginning of my poetry odyssey! 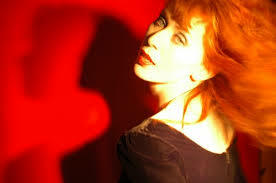 She is amazing, funny, poignant and highly observant of life around her. I hadn’t seen her perform for a while and was looking forward to it. We had a little moment to chat too, which was lovely and she encouraged me to enter Offa’s Press Submission – which I was already beavering away on – as if full week of work and LitFest wasn’t enough – I was also trying to compile a manuscript to send to Offa. I was delighted when Emma encouraged me to do it, confirming that my material was a match, lets hope Offa feel the same about my submission! Her set was amazing, loved it! 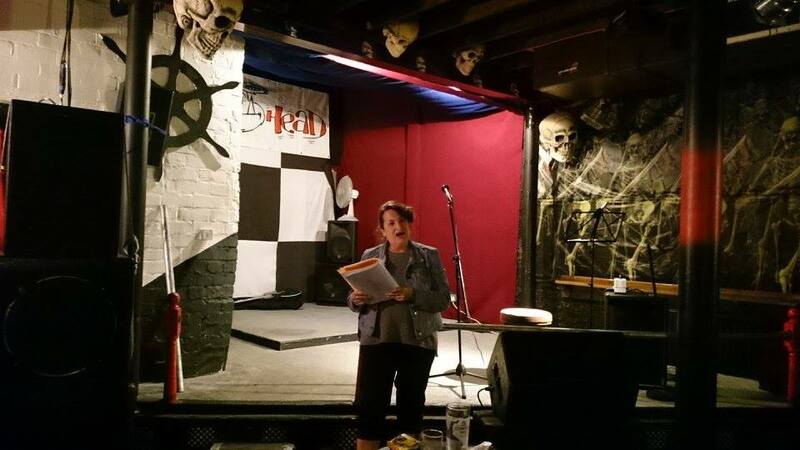 This was my final WLF event as I was performing in Birmingham on the Friday, partying over the weekend, I missed some cracking bits at the end – including Double whammy Slammy – Poetry and Flash – Congratulations to Brenda Read-Brown for winning the poetry prize, the 4th Slam Poet Champ of WLF. Twenty poets were commissioned to write poems on the theme Home-made, home-grown. Six have been chosen to appear on specially-designed postcards, with thousands of copies in libraries throughout the West Midlands. This year’s chosen poets, Fergus McGonigal, Roz Goddard, Emma Purshouse, Spoz (Giovanni Esposito), Jane Seabourne and Brenda Read-Brown will be appearing at the launch of the Poetry on Loan postcards – and they’ll all be performing their work for you. 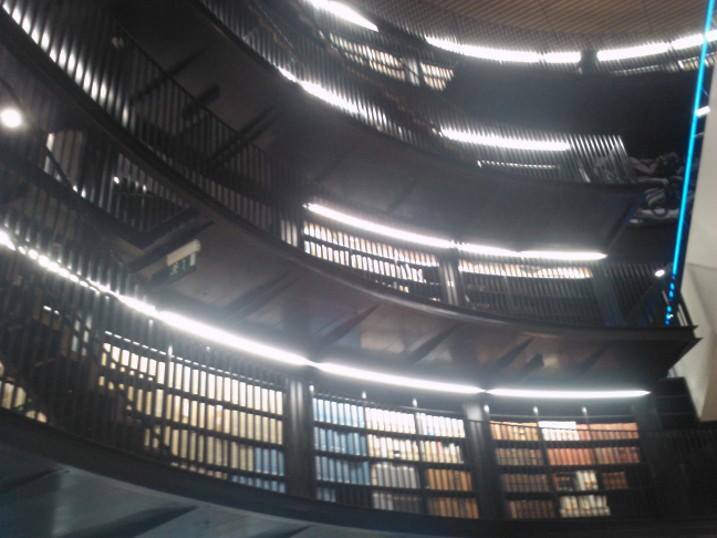 Having absorbed the Benjamin Zephaniah screening and filled myself with some food, I returned to the Library of Birmingham for Postcard Poets event. Sadly I took no pictures, it was a small room and other audience members were being well behaved! I was also enjoying the performances too much to peel my eyes from the stage, it was a great night, exceptionally entertaining! 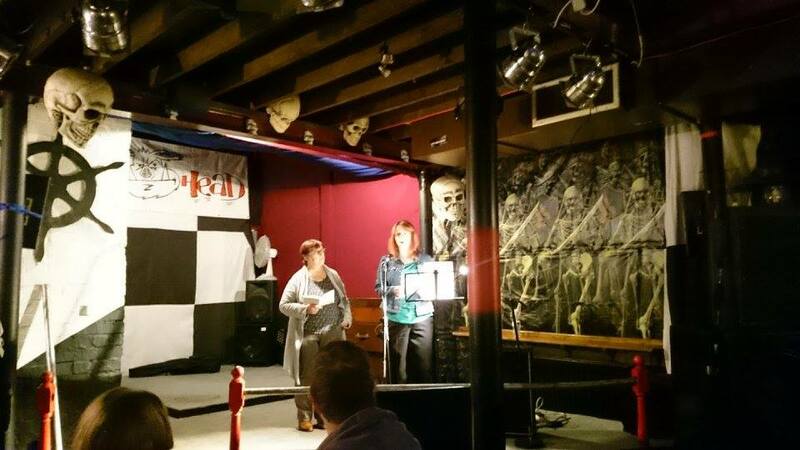 Postcard Poets was a great event. 20 Poets were commissioned to write poems around the theme of homemade and home-grown. 6 of these poets had come to perform a selection of poetry and their postcard poems. The postcards are free and available at all public libraries in the region. I really enjoyed this event and wished I wasn’t as tired as I was, I could barely stay awake and by the time I was home I was too tired to even talk! Some of whom I’ve met. Roz was on the picture writing course I took earlier in the summer, Fergus popped into the Sarah James book launch and has also been chosen as the MC for an open night event (that I will also write about) that I attended last week, WLF’s SpeakEasy. Spoz is regionally very famous, he lost his job (with many others) when the Rover car plant shut down (a major employer for generations in the region) he used his redundancy money to relaunch himself as a poet – a great slam poet who now works with lots of community based projects and has celebrated lots of success. I have seen tickets for his shows, but never managed to catch him. I was impressed by his energy. I loved discovering all the other performance poets. It was a fabulous evening and one of the best factors of this Literature Festival, is that many events were free, including this one – and it really was superb.